Okay. Please put Lafferton and Bevham in the list of places I don’t want to visit because of their high body count. Midsomer, Stockholm, Lafferton. Poor Lafferton. I think this, the fifth book in Susan Hill’s Simon Serrailer series, has the third serial killer in the Cathedral city since the first book. I don’t think Serrailer needs his high profile SIFT work: Lafferton is awash with killers! I know it’s an easy complaint to make of detective fiction series, but there are other crimes than serial killing! This time round, we witness an underbelly of Lafferton which we haven’t seen before: prostitution. Sympathetically portrayed local prostitutes Abi Righton and Hayley and Marie with their own dreams and problems. For a series which has felt – to me at least – uncomfortably middle class and complacent, this more inclusive tone was a pleasant change. These girls felt real and authentic, balancing the need to put money on the table with family commitments and health problems and the temptation to escape it in cider or cannabis. Besides them, Hill juxtaposes the new Cathedral Dean, Stephen Webber and his wife Ruth and the canon residentiary Miles Hurley who had arrived with the Webbers. The politics of their changes to Cathedral hymns and services and committees were cloistered and less engaging … but turned out to be vital. Beyond these changes, not much has altered in Lafferton since the end of the previous book: Simon Serrailler remains canonised at work but retains an inability to form any meaningful with women – and finally someone does the right thing and thumps him for descending on Taransay and hooking up with someone else’s fiancee. I don’t know why no one’s done it before! – and his relationship with his new step-mother Judith improves . Almost to the point when I was anticipating them having an affair! Cat continues to be the saintly caring voice in the novels. And prostitutes start disappearing and being found dead. And then other women start to be preyed on. It is a series which struggles with gender, thinking back. Brides. Sisters. Mothers. Prostitutes. Victims of Serrailler’s womanising. Women get hit hard by Hill. Even those who survive are haunted. This novel – with a fresh DS – was perhaps the most successful in the series so far. 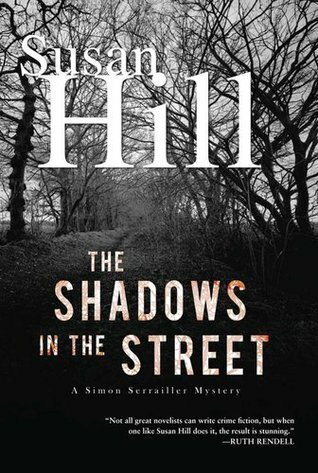 It is still more of a soap opera than police procedural: it is through no dint of police work that the killer is caught – but Hill does like to play with genre conventions. Pure luck rather than Serrailler’s genius solved the case. They are very comfortable and familiar now. The reading equivalent of a warm woollen jumper and cup of tea. And there’s nothing wrong with that!